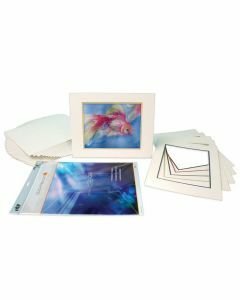 ClearBags® Show Kits include everything you need to display artwork and prints. Crystal Clear Protective Closure Bags ∼ Acid-free/Archival Crystal Clear Bags®, with Protective Closure are ideal for photography and art. Pre-Cut Mats ∼ Quality buffered∼ pH Neutral matting at an economical price. Choice of a single or double mat. Backing or Foam Boards ∼ Choice of ClearBags or Bainbridge® brands. 1/16 sizing. Mounting accessories and Premium Papers also available.